For details about Indian Verison CLICK HERE. Renault Scala comes in two variants Expression(HT/AT) and Dynamic (AT(higher end one)). The 1.5 litre SOHC 8 Valves 4 Cylinder 1461 cc Common Rail diesel engine delivers a Max Power of 84.8BHp @3750 rpm and Max Torque of 200Nm @2000 rpm. 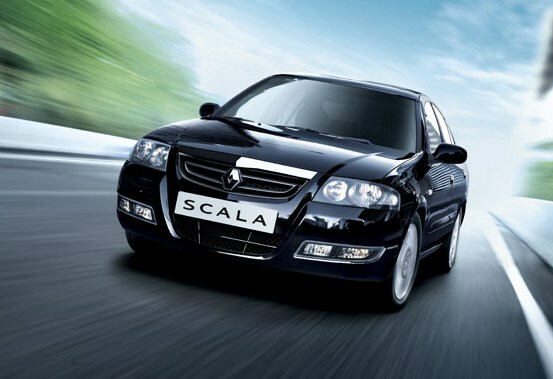 Renault Scala comes with a 5-speed manual Transmission gear box or a 4-speed automatic transmission gear box. Safety features of Renault Scala includes anti-lock braking system (ABS), dual air bags, ABS with brake assistance, EBD (Electronic brake distribution), Anti-skid device, 3 point front seatbelt with retractor, Front seatbelt pretensioner with load limiter (driver+passenger), Immobilizer. Other features of Renault Scala includes 55 litre Fuel Tank, 5 Seater, AM/FM/CD/MP3 radio, Green tinted windshield glass, Halogen headlamp, Front fog lamps, Front and rear power windows, 2 Din radio & CDP MP3 function and 4 speakers. Renault Scala comes with a price range of Rs. 7 lakh to Rs. 9 lakh. and will be launched in early November(during diwali time) in India. For more details about Indian Verison CLICK HERE. Tags:Renault Scala, Renault Scala features, Renault Scala specifications, Renault Scala review, Renault Scala details, Renault Scala availability, Renault Scala specs, Renault Scala images, Renault Scala pics, Renault Scala pictures, Renault Scala price.